Here's how to change the voice and feedback frequency settings. 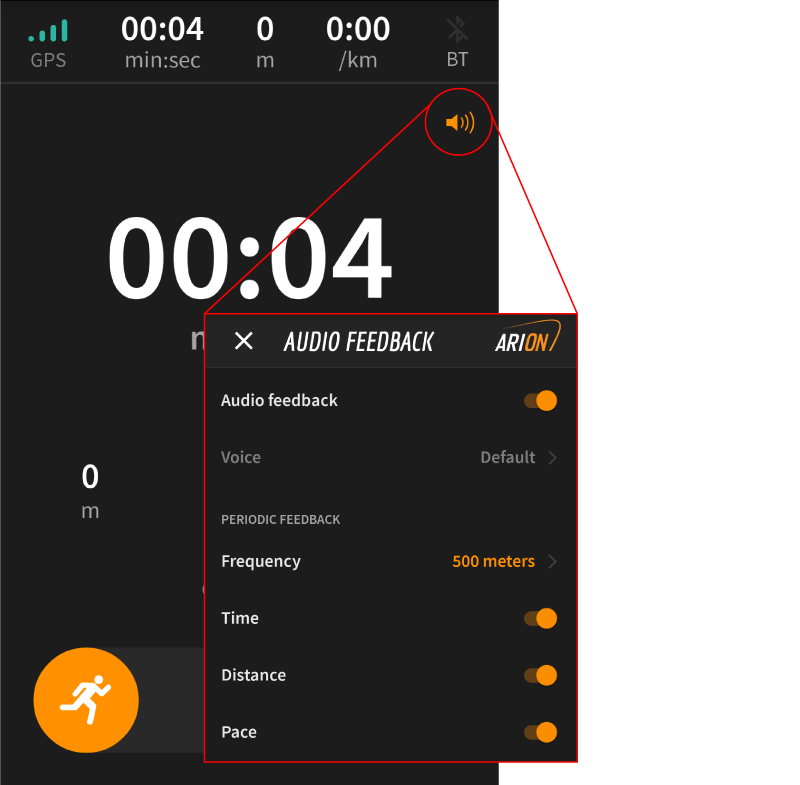 You can change these settings beforehand, or even on the fly during your run! Open the app and head over to Menu > Settings > Audio feedback. If you're just looking to turn off the audio feedback altogether, flip the switch all the way at the top of the list. The ARION app has access to the voices that are installed on your Android or iOS device. If you'd like to change this voice, first install a different voice on your phone, and then restart the app. You should now be able to select this voice in the settings. At the time of writing it is not possible to adjust the frequency of the real-time coaching. The ARION AI coach will give you feedback in real-time when you're moving in or outside of your target zone. It is however possible to turn off the real-time coaching feedback by simply flipping the switch. The periodic feedback can be customized in the following ways. By default, you will receive periodic feedback about the time, distance, pace, and target zone results. These can all be turned on or off using the flip switches. Furthermore, you can adjust the frequency of the periodic feedback. You can choose between a time based frequency (e.g. 10 minutes) or a distance based frequency (e.g. 1 kilometer). If you don't want to receive periodic feedback, simply change the frequency to 'Never'. Note: You can change your measurement units from metric to imperial (and vice versa). This will then also be used in these frequency settings. 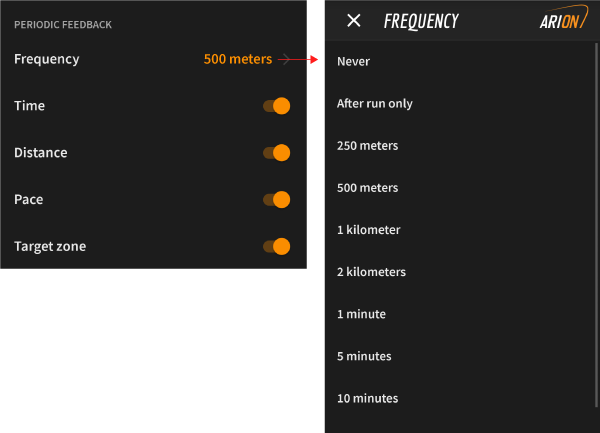 You can even change some of these settings on the fly during your actual run! In the running screen, simply press the audio icon in the top right (see image below) to access the audio feedback settings. When you change any settings here, they will take into effect immediately for the remainder of your run.